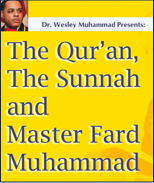 Using the Arabic and Hebrew original texts from the Holy Qur’an, Bible and Hadith, Dr. Wesley Muhammad appeals to the former followers of the Hon. Elijah Muhammad who now follow Orthodox Islam. His message: You can come back home to Elijah and Supreme Wisdom without abandoning the Holy Qur'an and the Sunnah of the Prophet Muhammad (Peace Be Upon Him). This lecture was presented at Muhammad Mosque No. 7 in New York, NY USA on May 23, 2010.